Bottom Line: I can see how Nocturnal Animals has divided audiences and I’m actually surprise the audience score is as high as it is on Rotten Tomatoes (72%). This is likely not a movie for the casual filmgoer or really anyone that doesn’t want to think too much while watching films. I loved it though. It’s beautifully shot, extremely well acted, and the multiple narratives seem complex but are actually pretty simple and intertwine extremely well. Here’s the gist: Amy Adams plays a woman deep into her second marriage and things seem to be falling apart between them. While her husband is away in NYC (cheating on her) she receives a manuscript from her previous husband (Gyllenhaal) that she begins reading. The story is about a man (Gyllenhaal again), and his wife and daughter, driving along a deserted Texas highway and being forced off the road by some hooligans that torment the family and eventually take off with the two women. The man teams up with a local sheriff (Shannon) to locate the two women. While reading the manuscript, Adams’ character finds herself reflecting on her own life and wondering about the choices she’s made. I tried to type that synopsis up with as few spoilers as possible. I highly recommend watching Nocturnal Animals knowing absolutely nothing about it… like I did. Michael Shannon gives a terrific (and Oscar nominated) performance as the Texan sheriff and the rest of the cast is great as well. Jake Gyllenhaal always seems to be solid, if not quite amazing, in any role he takes on and this film isn’t any different for him. 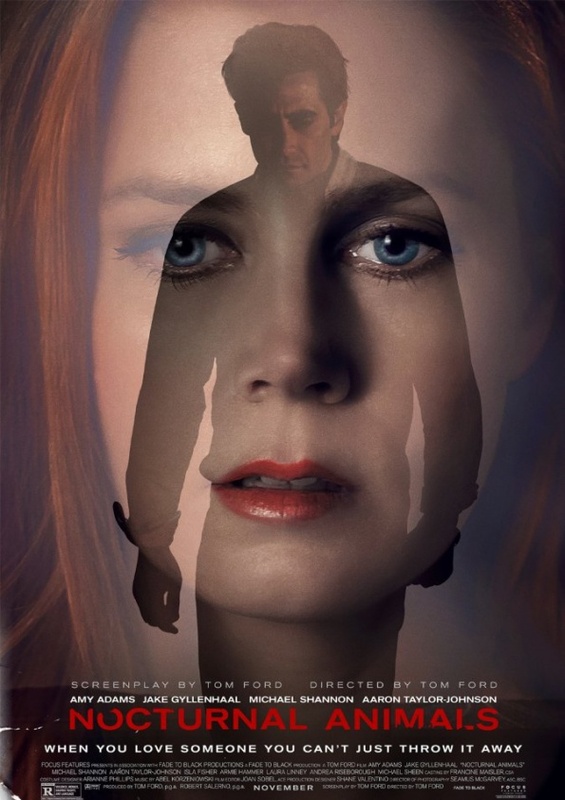 Amy Adams’ character is quite a bit more interesting. In flashbacks, she seems genuine, somewhat optimistic, and perhaps quite a bit naive and in the present she says very little but exudes sadness and a palpable coldness. It’s a nuanced performance that will probably be appreciated more over multiple viewings. Also, it’s a bit of casting genius to have Isla Fisher in the role of the wife in the manuscript as Fisher and Adams have long been linked as doppelgangers of one another. Nocturnal Animals is a brilliant film. If you found yourself unsatisfied when the credits started rolling, work a little harder. Do some research and figure it out. If you don’t want to do that, then Nocturnal Animals definitely wasn’t for you. This movie fires on all cylinders, while combining Western thriller with psychological warfare and a classic revenge tale. I still haven’t seen some critically acclaimed films from 2016, but right now I feel comfortable ranking Nocturnal Animals as high as #3 on my list and I won’t be surprised if ten years from now I look back on 2016 and it’s the film I remember most. I highly recommend it, but be warned: you’re going to have to use your brain because it’s not all spelled out for you. Replay Value: This is the kind of film that if you liked it, you’ll surely want to watch it again. Probably immediately. Oscar Potential: Michael Shannon was nominated for Best Supporting Actor and, in what I felt was a rather weak year for films, was probably robbed of multiple other nominations. Nocturnal Animals stuck with me way more than La La Land and Fences, for instance, and it seems criminal that the film received zero technical nods.